Petro Packaging Company was recently featured in a special article of the May 2016 edition of Plastics News Magazine. 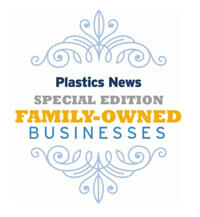 The article featured “Family Owned Businesses” and the challenges of passing the baton from generation to generation. It focused on some Petro family history, a brief synopsis of how the business got started, and some important goals and challenges of the Petro family. The article was titled: “Every day is Father’s day at Petro Packaging.” The article was written by the owners of the company who are happy to share that their children are the third generation of the Petro Family working full time to continue the business. Petro has always been a family owned and operated company since the 1950’s when it was first established. In addition to three generations of the Petro Family, our company has been supported by loyal and dedicated non-family employees serving Petro for over 40 years!